This is Part 2 of a 3-part series on GE’s Brilliant 1.6-100 wind turbine. Read Part 1 here, and keep an eye on CleanTechnica or our GE Brilliant Wind Turbine archives for Part 3. 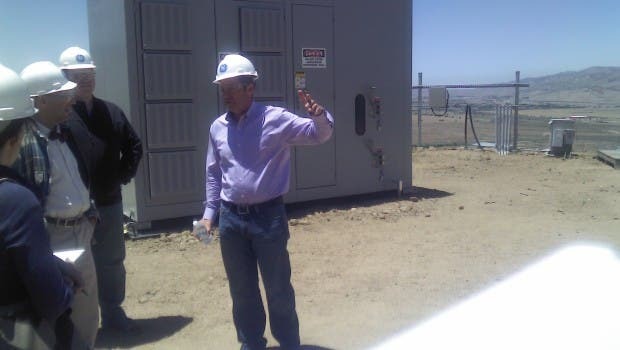 GE Power & Water Wind Products GM Keith Longtin in front of the Brilliant 1.6-100’s battery storage bank. Because batteries perform so much quicker than thermal generation, they [wind power producers] should receive a multiplier to current prices – up to 1.9-times current prices. Market prices for frequency regulation on regional transmission organization (RTO) PJM’s power grid recently reached as high as $14.92 per megawatt-hour (MWh) from January to October 2012, $36.52/MWh from October to December 2012, and $33.87/MWh from January to March 2013, Theile pointed out. Using the Brilliant 1.6-100’s integrated battery storage capabilities means wind farm operators can balance the wind-generated electricity they produce with grid load at under $1 per megawatt-hour, according to GE Power & Water. Moreover, the system’s “advanced forecasting algorithms and a small amount of short-term storage dramatically reduces the need to carry spinning reserves and frequency regulation for wind power,” Longtin added. When it comes to battery chemistry, GE Power & Wind is agnostic, he explained. 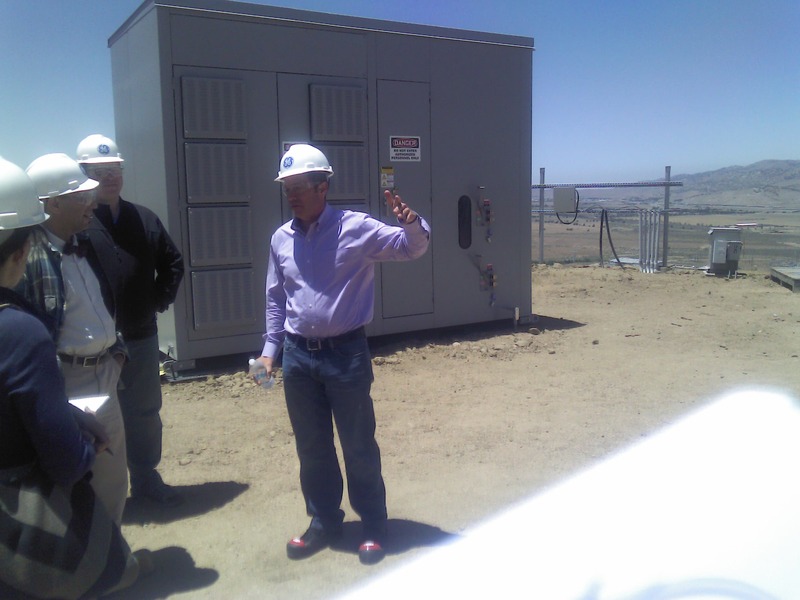 The sodium-nickel chloride GE Durathon batteries incorporated in the Brilliant 1.6-100 prototype at Tehachapi can range from 20–70 kilowatt-hours (kWh) in energy capacity, about 25-50 kWh per turbine. GE and wind farm operators might choose to install alternative batteries, such as Li-ion batteries, at wind farm sites where operating and grid power market conditions differ, offering wind farm operators a customized solution. The GE Research site outside Tehachapi, California has been serving as a wind turbine proving ground since the 1980s, a history that is on exhibit in an on-site museum. GE acquired its part of the vast property back in 2002 in the wake of the Enron scandal, when it acquired the assets of Enron Wind Systems, which in turn acquired the property when it bought up the Zond Corporation in 1997. One of the first GE 1.5–77 wind turbines was erected on site in 1998–1999, and the company is gearing up to erect a prototype space-frame wind tower there this summer. Besides serving as a wind turbine research center, employees at the Tehachapi facility also assemble machine heads for GE wind turbines. All told, today, GE Renewable Energy employs some 3,000 people around the world. Drawing on human resources and experience spanning the industrial engineering giant’s worldwide operations, some 80% of the employees at GE Global Research centers hold PhDs. The design specs for the Brilliant 1.6-100’s Durathon battery bank, for instance, came out of GE’s transportation unit, where GE’s smart, hybrid locomotives were first developed. Aerodynamic design features incorporated in the 1.6-100’s design were the result of work originally undertaken in GE’s aviation and gas turbine divisions, as were advances in integrating turbines with battery storage, Longtin explained. A view of the ridge line above the GE research center (pictured above) attests to the site’s long history and the advances that have been made since the ’80s, as well as to the long life of wind turbines. It’s practically carpeted with wind turbines of varying age, design, capacity, and make – from the latest, utility-scale GE Brilliant 1.6-100 to Vestas V15/65s, V17/90s and other smaller scale turbines with capacities ranging from 65–200kW that date back to the 1980s… and continue to spin. For Part 3 in this 3-part series, coming tomorrow, keep an eye on CleanTechnica or our GE Brilliant Wind Turbine archives.